Today, we released a new version of Free Skype recorder, it has improved the compatibility with new version of Skype App (which installed from Windows store) and the new Skype 8. The automatically recording Skype call feature also has been improved, it will auto record the Skype call when the call get connected whatever you are using the Skype App or Desktop of Skype. And record the correct caller name at the same time. 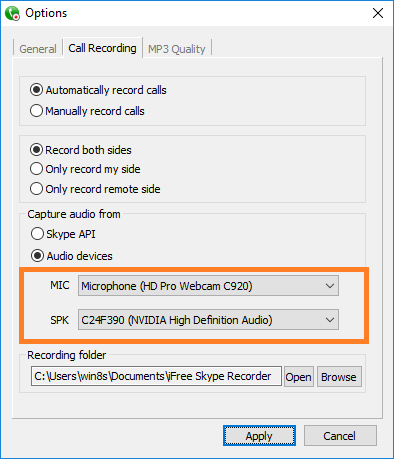 Because of the Skype API has been abandoned, the new version of free Skype recorder supports recording audio data directly from your microphone and speaker devices. If your computer has plugged in multiple audio devices, you should open the iFree Skype recorder settings to select the correct audio device which you are using on Skype. And now, you can record any sound from computer whatever this is a call or not. You can record the game sound, movie sound, radio sound and so on. Enjoy it, it’s your 100% FREE Skype call recorder. This entry was posted in Skype Video Recorder and tagged free Skype recorder, iFree Skype recorder, record Skype free on December 4, 2018 by admin.